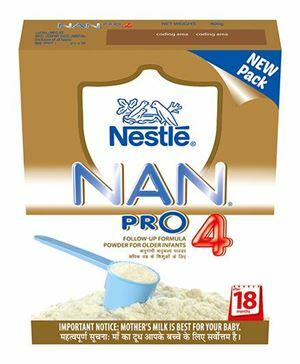 FEATURES: Nestle NAN Pro 1 is a spray dried infant formula with probiotics for infants from birth (up to 6 months) when they are not breastfed. 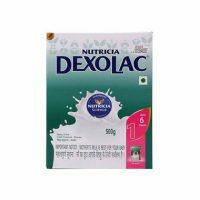 It contains Bifidus BL, a beneficial probiotic culture the helps in increasing the number of bifidobacteria in the gut flora of infants. A healthy gut flora helps support your baby’s immune system. 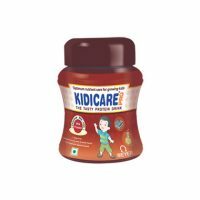 It is a spray dried infant formula for upto 18 month’s baby. On opening, transfer the contents of the pack along with the pouch to a clean airtight container. After each use, replace lid tightly and store in a cool, dry place. 1st & 2nd Weeks: Boil 90 ml of water and then cool till lukewarm (about 40 C). Mix 3 level scoops of Nan Pro 1 and stir until dissolved. Once prepared, use the infant formula immediately. Do not store. 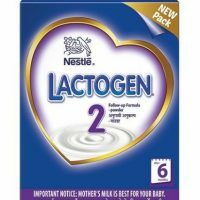 Recommended 6 feeds per day. 3rd and 4th Weeks: Boil 120 ml of water and then cool till lukewarm (about 40 C). Mix 4 level scoops of Nan Pro 1 and stir until dissolved. Once prepared, use the infant formula immediately. Do not store. Recommended 5 feeds per day. 2nd Month: Boil 150 ml of water and then cool till lukewarm (about 40C). Mix 5 level scoops of Nan Pro 1 and stir until dissolved. Once prepared, use the infant formula immediately. Do not store. Recommended 5 feeds per day. 3rd and 4thMonths: Boil 180 ml of water and then cool till lukewarm (about 40C). Mix 6 level scoops of Nan Pro 1 and stir until dissolved. 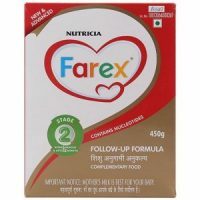 Once prepared, use the infant formula immediately. Do not store. Recommended 5 feeds per day. 5rd and 6th Months: Boil 210 ml of water and then cool till lukewarm (about 40C). Mix 7 level scoops of Nan Pro 1 and stir until dissolved. Once prepared, use the infant formula immediately. Do not store. Recommended 5 feeds per day. Note: Wash your hands before preparing the infant food. Also wash all utensils (cup, spoon, etc.) to be used thoroughly.